Following are some links to housing-related resources. Please note that the Housing Authority does not endorse or recommend any particular service, business, or agency. Search 2-1-1 online, a comprehensive community services search tool that connects residents. The United Way offers a list of member agencies that provide services. Santa Cruz Public Libraries Community Information Database. Landlord Training Manual – A practical guide for Santa Cruz City Landlords and property owners. City of Santa Cruz Interim Rental Housing Ordinances – On January 8, 2019, the Santa Cruz City Council passed Ordinance No. 2018-20 Amending Chapter 21.03 of the Municipal Code as pertains to Relocation Assistance for Displaced Tenants. This ordinance was passed for adoption January 11, 2019. The document below summarizes this ordinance. The City of Santa Cruz has posted a Frequently Asked Questions (FAQ) page on the Relocation Assistance for Displaced Tenants, as well as the ordinance on their website, linked here. Craigslist online apartment listings in the South Bay area. Search the Santa Cruz Sentinel classifieds here. Search the Watsonville Register-Pajaronian classifieds here. Search the Hollister Free Lance classifieds here. HUD‘s resources for first time homebuyers. Information about reverse mortgages from HUD. Homepath – Fannie Mae’s resource page for first time homebuyers. Keep your Home California – Programs designed to help you keep your home if you have suffered a financial hardship. GreatSchools is a national non-profit educational resource for parents, with a free web-based tool for parents who want information on local schools. This user-friendly website offers a database of more than 200,000 PreK-12 public, charter, magnet and private schools across the U.S., and includes information on how parents can choose the best school for their children. Consumer Financial Protection Bureau – Clear, impartial answers to hundreds of financial questions including auto loans, credit cards, student loans, debt collection, bank accounts, credit unions and more. PensionHelp America – Have a question about your retirement plan? Not sure where to turn for help? PensionHelp America can connect you with counseling projects, government agencies, and legal service providers that offer free information and assistance. By leading you through a series of questions, PensionHelp America will put you on the path to getting the help you need. Free Federal and State Income Tax Preparation – Find a Volunteer Income Tax Assistance (VITA) or Tax Counseling for the Elderly (TCE) site near you and learn what to bring to have your tax returns prepared. Career Centers – A network of centers which offer an array of no cost services for businesses, employees, and job seekers. The Capitola EDD Center has a Veterans employment services representative. Community Action Board of Santa Cruz County, Inc (CAB) – Programs assisting low-income people with emergency, sustaining/self-sufficiency services, including the Shelter Project, and information and referral. Homeless Service Center for homeless people (831-458-6020). Encompass – Child Development Programs, programs for youth, and adults with psychiatric disabilities and substance abuse issues. Vista Center for the Blind and Visually Impaired serves people who are blind or visually impaired. Community Bridges – Programs including children and nutrition, seniors and transportation, and family resources centers. Senior Network Services Provides information and referral, senior housing, in-home care registry and more. Senior Council – service, support and advocacy for seniors. Central Coast Center for Independent Living provides services and support to persons with disabilities. San Andreas Regional Center serves persons with developmental disabilities Legal Assistance. 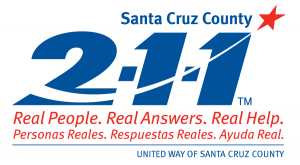 Santa Cruz County Free Guides – Information to get free help, meals, showers and toilets. California Rural Legal Assistance – Access to justice for the poor. Senior Citizens Legal Assistance – Access to justice for the elderly. Self Help Superior Court Santa Cruz County – Assists self represented customers with a variety of basic legal issues. The SHC includes the services of the Family Law Facilitator and the Small Claims Advisor. County of Santa Cruz Human Services Department provides basic services for children and families, seniors and veterans, as well as employment and workforce services. Santa Cruz Veterans Resource Center – VRC offers Supportive Services for Veterans and their Families. The focus of SSVF is housing stability. US Department of Veterans Affairs – Health Care, Benefits, Referral to housing assistance and more. County of Santa Cruz Health Services Agency provides basic health services, clinics, public health, services for people with disabilities, and environmental services. Department of Fair Employment and Housing – The mission of the Department of Fair Employment and Housing is to protect the people of California from unlawful discrimination in employment, housing and public accommodations, and from the perpetration of acts of hate violence and human trafficking. Financial assistance programs from PG&E to help with utility bills. Learn more about energy efficiency through the federal Energy Star program. The mission of the Housing Authority is to promote access to quality affordable housing, utilize housing as a platform for improving quality of life, and support inclusive, healthy and sustainable communities free from discrimination. In this spirit, the Housing Authority has compiled a list of resources for immigrant families, many of whom have expressed concern about recent changes in immigration policy and enforcement. At this time, the Housing Authority is not aware of any proposed changes that would impact immigrant families receiving assistance through the federal housing programs we administer. However, If changes are proposed that would reduce the benefits offered to our families, the Housing Authority will work actively with local, statewide, and national organizations in collective advocacy to support all of our program participants, including immigrant families. La misión de la Autoridad de Viviendas es promover el acceso a viviendas de calidad a precio razonable, utilizar la vivienda como plataforma para mejorar la calidad de vida, y apoyar comunidades inclusivas, saludables y sostenibles, libres de discriminación. En este espíritu, la Autoridad de Viviendas ha compilado una lista de recursos para familias inmigrantes, muchas de las cuales han expresado su preocupación a causa de los recientes cambios en normas de inmigración y su cumplimiento. En este momento, la Autoridad de Viviendas no conoce ningún cambio propuesto que pueda impactar a las familias inmigrantes recibiendo ayuda por medio de los programas federales que administramos. Sin embargo, si se proponen cambios que puedan reducir los beneficios ofrecidos a nuestras familias, la Autoridad de Viviendas trabajará activamente junto con las organizaciones locales, estatales y nacionales para advocar el apoyo a los participantes de nuestros programas, incluyendo a las familias inmigrantes.